without a special download cable. BBC[EDX-303] is tested under these OS below, and is not supported for Mac and Linux. [...] : You can select a bit file to use. Dir : A directory part of the rbf file path. Always Front : Keep the windows on top. 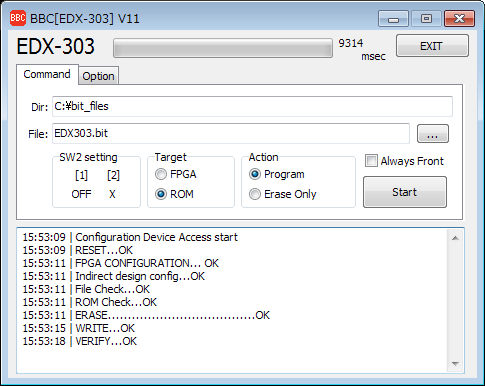 Use default port description : Default USB port description of EDX-303 will be used. Save Setting (ini file) : You can save the file path and other settings for next launch. Show System Message : You can see more detailed log. Find Ports : You can see ports which are detected on PC. You can set the file path and execute comfiguration. -F file path Set the file path fields. Both relative and absolute path are OK. Same directory of exe will be used when you set just only file name. 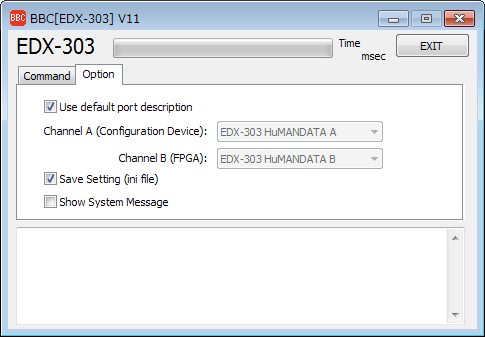 -A none Configure the FPGA. 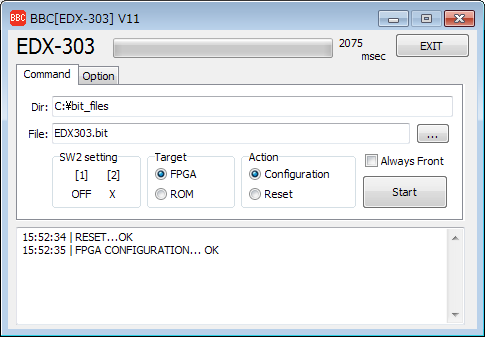 -R none Reset the FPGA reset. -E none Erase the configuration device. -N none Check the done pin condition. -G Positive integer Set time to close. The zero will keep the tool alive. Maximum value is 10. Default is 3. -K none Do not save an ini file when close. Note : Use start command with a /wait option command to get proper exit code.